When the biggest day in our lives is finally here, a bit of stress is unavoidable. No matter how prepared the couples are for their wedding day, sometimes certain things can be forgotten during the hectic morning preparation process. In order to skip any unpleasant incidents, let me guide you with an example on the perfect 12 hours wedding day schedule. Certainly, every wedding is different in their schedule and rituals, but I want to mention some of the details from my professional experience that could give you an idea of how the wedding day is usually planned. We start by taking pictures of his accessories: his watch, perfume, cufflinks, glasses etc. While the groom is getting dressed, we photograph his tuxedo, shirt and bow tie. It is always important for the groom to choose a person in advance who will help him to put on his tuxedo and attach a boutonnière. You can choose a few people if you desire, a relative or and a close friend. It is a very special moment to be captured, and you want these people to be by your side. When the groom is dressed up and ready for his special day, we finish off documenting the preparation process by a family portrait. Family members must be ready by the time the groom is dressed up. The groom's preparation time usually takes one hour, including the fifteen minutes for the "details" pictures. During that hour, the bride is preparing her hair and makeup just before she starts her own part of the preparation process. We try to arrive a few minutes earlier during the time when the bride is in the process of getting her makeup done, this way we can capture the final touch ups, like a few brush strokes on her face or a lip gloss application. It is essential to photograph the bride's wedding gown before she puts it on. It takes the same time for the bride to prepare, as for the groom, an approximate of one hour including the 15 minutes for the details, the jewelry, the veil, the shoes and perfume. The bride's family and friends also need to be ready for the most important part of the pre-wedding photo session. It is a very emotional moment and everyone have to be on the pictures. Usually the ceremony takes one hour, but most of the time we just follow the event as it goes. It is understandable that after the ceremony each of the invitees would want to congratulate you and spend some time with you. 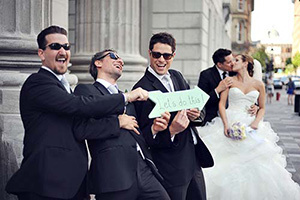 However, it is important for the bride and the groom to keep in mind the limited time left for their couple pictures. It is always better to be on time for that part. For example, at 3:30 PM the newlyweds are free to go after their ceremony and it usually takes about half an hour to arrive to the destination where the couple pictures will be taken. An exception applies if the chosen couple pictures photo session is located at the same venue as their reception. The couple pictures could take from 1 hour 30 minutes to 2 hours, depending on the proximity of the location and its surroundings. The time for a couple picture photo session should last no longer than 2 hours, otherwise the couple will get tired before their reception. If you have don't have any time left for your couples pictures, don't worry, you can always have your couple photo shoot scheduled after your wedding. This way you will be able to choose a special place where you would like your pictures to be taken. The reception usually starts around 6:00 PM, and we take the pictures of the settings and the tables 15 minutes before the guests start to arrive. It is very important to photograph the cake before the bride and the groom cut it. Usually it is scheduled after the dinner around 10:00 PM. At around 10:30 PM it is time for a bridal bouquet and a garter toss. We finish our day of photographing the wedding right after that. I just want to suggest for the bride and the groom to plan ahead their wedding day. There could be some unpredictable moments and you really have to be prepared for that. Create your own schedule, and try to follow it during your wedding day. It is always better to send your prepared schedule to your photographer and videographer. It is important to give time to your photographer and videographer to document the most memorable moments during the preparation process - one hour for the bride and one hour for the groom is preferable. Also, try to schedule your couple pictures after the ceremony for a minimum of one hour or two hours if you are more flexible. The morning preparation and the couple pictures are the most important aspects to be considered when planning your wedding schedule, the rest can be planned according to your own arrangements.